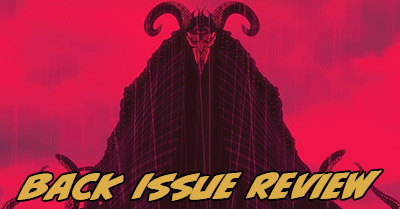 Back Issue Review: Alan Moore’s The Courtyard, Captain Canuck, Dark Ark, & more! Welcome to a pilot of a new series of comic book posts on Crushing Krisis – Back Issue Review! If I tried to complete my quest to read 2018 comic issues in 2018 purely by keeping up with new releases, I’d have to read 39 new comics every week! Since my pull list isn’t quite that deep, I pad out my new release reading (and my playing catch-up to get current with new releases) with a healthy amount of back back issue reading, both from my own ridiculously deep collection and in browsing for digital deals. Interested in what I have to say about other random pulls? Leave a comment about a series you’d love to see me dig into in the coming weeks. Given the scope of my collection, you might be surprised to learn I already own a copy! [Read more…] about Back Issue Review: Alan Moore’s The Courtyard, Captain Canuck, Dark Ark, & more!